Chanteur Country US né le 7 Février 1943 à Tampa (Floride). 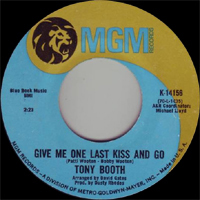 Country singer/songwriter/guitarist Tony Booth grew up in Tampa, but launched his musical career in the Southwest. He made his professional debut with the Mel Savage Band and soon toured with Jimmy Snyder. 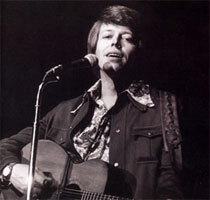 In 1968, after founding the band Modern Country, Booth began working in Las Vegas and from there moved to clubs in California. 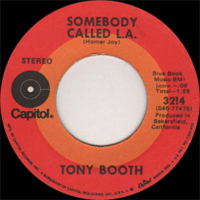 He renamed the group the Tony Booth Band and became the house band at the Palomino in California. He cut his first single, "Big Lonely World," with K-Ark and signed to MGM in 1970, where he had his first hit with a cover of Merle Haggard's "Irma Thompson." 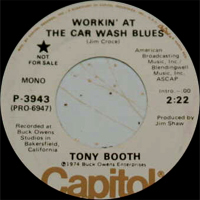 Booth's career really took off in 1972 when he scored three Top 20 hits, including "The Key's in the Mailbox." The next year he had five more hits, including a cover of the Doris Day hit "Secret Love" and "When a Man Loves a Woman (The Way I Love You)." However, his career waned and he only had three minor hits in 1974. 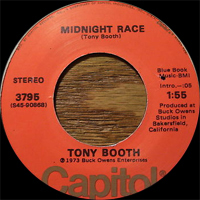 After releasing two unsuccessful singles, Booth was dropped from Capitol in 1975. Two years later, he recorded the single "Letting Go" with United Artists and did not appear on the charts again. During the 1990s, Booth played with Gene Watson's band. 196? SP KARK 668 (US) Big Lonely World / ? 1971 SP CAPITOL 3214 (US) Cinderella / Somebody Called L. A. 10/2009 CD ? (US) THE ESSENTIAL - Cinderella / Out Of Ways To Try / Happy Hour / Lonesome 7-7203 / Close Up The Honky Tonks / Congratulations, You're Absolutely Right / What A Liar I Am / Under Your Spell Again / Old Faithful / Down At The Corner Bar / Colors I'm Gonna Paint The Town / The Devil Made Me Do That / The Keys In The Mailbox / Would You Settle For Roses?